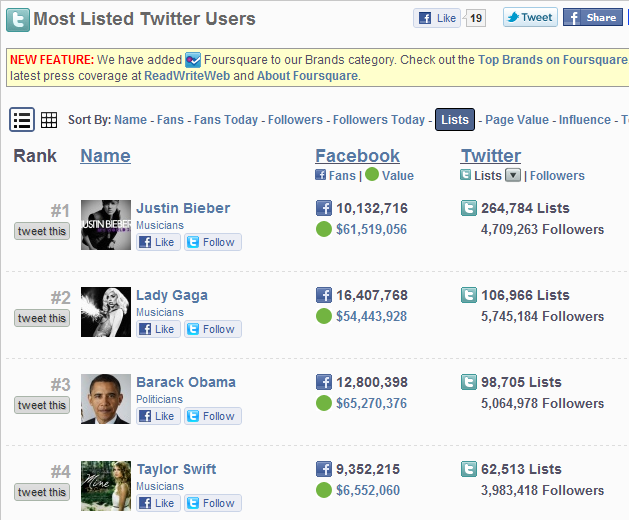 Who Are The Most Listed Twitter Users? Now that the Twitter API finally allows for retrieval of the number of times a Twitter user has been added to a list, celebrities can now brag about something other than their numbers of followers on the popular micro-sharing service. Fan Page List noted the addition of the new fields in the Twitter API and quite rapidly came up with a handy ranking that gives you an overview of both stats for the most popular Twitter users, as well their number of fans on Facebook. Unsurprisingly, celebrities (i.e. persons) rule the ranking, with musicians like Justin Bieber and Lady Gaga topping the charts with over 264,000 and 106,000 counts on lists, respectively. Number three is Barack Obama, the only politician in the top 40. The Twitter account for CNN Breaking News is the first media company in the ranking with an appearance in over 61,050 lists, while Microsoft founder Bill Gates makes it to the top 13 spot with nearly 50,000 list counts (and he’s a retired CEO, booyah!). The company account with the most list counts is Google, ahead of Twitter, with close to 41,000 list appearances. Ricardo Kakà and Shaquille O’Neal are popular athletes, apparently. TechCrunch made spot number 35 on the ranking, and we’re not resting until we surpass The Onion (#26), although admittedly they’re way more funnier than we could ever dream to be. On a sidenote: a good place to start for great Twitter lists is Listorious.